Racine Foster, Editor, 718 Magnolia Ave., Orlando, Florida. Harper & Brothers, Publishers in the fall of 1958. A bromeliad tree — meaning a tree planted with bromeliads — can be a decorative accent in many indoor gardens. While the luxuriant growth on the greenhouse specimen pictured on the cover cannot always be duplicated in the house, highly satisfactory results can generally be obtained if interesting plants are used on unusually shaped stumps or roots. Driftwood is good for this purpose. Its gray color contrasts with the blue-green of much of the bromeliad foliage, and it can often be found in complicated and twisted shapes with natural cavities for planting. The tree in the picture was the root of a giant sycamore, which was uprooted and washed free of soil in the hurricane of 1955. What looks like the trunk is actually the portion of the root nearest the stump, and the branches are the smaller roots that extended outward into the soil. Like the roots of many trees, they fused together as they crisscrossed through the earth — forming intricate loops and occasionally enfolding a rock in their twining grasp. You can see the bottom of such a rock just below and to the right of the center of the mass. Two feet of the root stem is buried in the ground so that it stands firmly in place. Aechmeas, Billbergias and Cryptanthi are the most prominent bromeliads on the tree. In addition, if you look closely, you will see less common members of the family like the pendant Acanthostachys on the right and the Spanish moss on the top, and also some other epiphytic plants such as the birds nest fern near the bottom. An Anthurium which is scarcely visible in the center of the picture has grown well and bloomed several times. Preparing the tree for planting is a fascinating task. In your mind's eye, picture where the clumps of bromeliads will look best and then search for natural crevices near these spots — knotholes, patches of decay or crotches where the tree has branched — which you can enlarge enough to accommodate the plants. I use an augur and a heavy gouge to shape the cavities, and I bore at least a half inch hole downwards from the bottom of each to provide drainage. Indeed, many of the cavities more nearly resemble tunnels, tapering slightly, so that osmunda fiber can be packed firmly into them. Naturally the dimensions vary. I try to get at least as much space as a 2" pot. The bromeliads are "planted" by wrapping their roots in sphagnum and osmunda and pressing them firmly into the cavity or crevice. The trick is to use small plants, which take hold faster and grow better, and to apply real pressure to the osmunda around them, anchoring them securely and establishing close contact between the fiber and the roots. If you want a plant at a spot where no cavity can be hollowed out, the wad of osmunda can be held in place with cork bark and wire or with wire alone. Again be sure that the wire is tight and the anchorage firm. After several months the bromeliads will fasten themselves in place with a new system of holdfast roots and will begin to put out shoots and offsets, forming the massive clumps shown in the picture. Culture is about the same as for bromeliads in pots, although watering may be needed a bit more frequently if a large proportion of the osmunda is exposed to the air. Because the water must, and will, drain rapidly out of the fiber, the tree should be in a ground bed or the floor beneath it should be protected from drip. Northwestern Ave. & Thomas Road, Philadelphia 18, Pa.
Research Service, Crops Research Division, Plant Industry Station, Beltsville, Md. 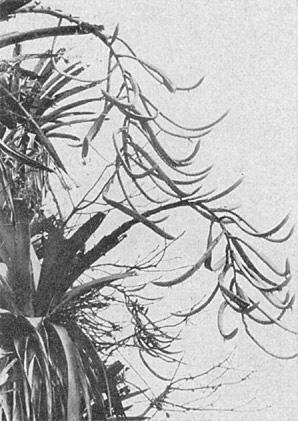 Seeds of Puya berteroniana required light for germination in 1956 tests ( Bromel. Soc. Bull. 6: 67-68, 1956). Additional seeds of this species supplied by Mulford Foster enabled us to study further its germination requirements. Throughout the latter experiments no germination occurred in the dark, whereas 75 percent of the seeds germinated when irradiated daily for 8 hours with light from incandescent-filament lamps. Realizing that the quality of the radiant energy emitted by the incandescent lamps was partially inhibitory to germination (Ann. Rev. Plant Physiol. 7: 299-324, 1956), we tested fluorescent lamps and obtained more germination than with incandescent ones. Since many light-sensitive seeds, such as those of lettuce, peppergrass, and tobacco, germinate very well after brief irradiations (10-seconds to several minutes), it seemed unlikely that seeds of Puya berteroniana required 8 hours of light daily for the first 10 days of the 17-day period of germination. Attempts to induce germination by exposures to light for 30 minutes each day for 10 days were not successful. However, if each 30 minutes of light was divided into two 15-minute periods separated by 12 hours of darkness, germination was equal to that obtained by use of 8 hours of light per day. Reducing the duration of each exposure below 15 minutes resulted in a decrease in germination. However, one of the two daily exposures could be reduced to 4 minutes if the other exposure made 8 to 12 hours later was for 15 minutes; then about 70 percent of the seeds germinated. All experiments mentioned so far were conducted at a temperature of 70° F. The natural habitat of Puya berteroniana is 400 to 1,500 meters with no forests and often freezing temperatures. Therefore, it seemed reasonable to assume that seeds of this species probably germinate in nature at temperatures somewhat less than 70° F. A germination test made at several temperatures and at two durations of light showed that maximum germination was obtained at 60° F (Table 1). Subsequent tests showed that germination was less at still lower temperatures. Table 1. Effect of light and temperature on the germination of seeds of Puya berteroniana. 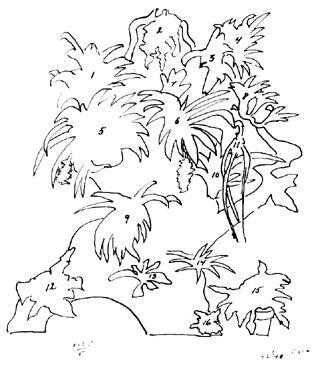 Mulford Foster pointed out that seeds of most bromeliads do not germinate well when covered by sand, peat or other potting medium (Bromeliads — A Cultural Handbook, 1953). Thus, it seemed probable that the seeds of many bromeliads besides Puya might require light for germination. With Dr. Lyman Smith acting as intermediary, we obtained seeds of many species of bromeliads from Mrs. A. Abendroth of Teresopolis, Brazil. These seeds were collected from individual plants and each test was made with seeds from a single plant. Since the species tested grow in the area around Rio de Janeiro, we selected 74° F as the temperature for our germination tests. Other procedures were also standardized. The seeds were placed in glass-covered dishes (Petri dishes) on blotters soaked in tap water. As soon as the seeds were counted onto the blotters, the dishes were placed under two layers of black cloth. About 48 hours later all dishes except the dark controls were placed under lights, where they received the treatments listed in table 2. The light was obtained from two 40-watt standard cool white fluorescent lamps that provided an illumination of about 70 fc. Table 2 shows the results obtained in tests with seeds of 22 species of bromeliads of 9 genera. Seeds of Vriesia lubbersii, V. incurvata, and V. petropolitana germinated in the dark. Germination of seeds of V. lubbersii, however, was somewhat better in the light and that of seeds of V. incurvata and V. petropolitana were very much better. The three Tillandsia species germinated equally well in light or darkness at the temperature used. However, it is known from work with other kinds of seeds that such seeds may become light-requiring under somewhat unfavorable temperature conditions. Table 2. Germination of seeds of several species of bromeliads under several light conditions at 74° F.
It was notable that seeds produced in capsule-type fruits, such as those of Tillandsia, Vriesia and Pitcairnia, required a longer period for germination than did seeds produced in baccate fruits, such as those of Neoregelia, Nidularium, Aechmea, Canistrum, Billbergia and Quesnelia. Moreover, additional experiments with seeds of Billbergia elegans indicated that when light is required for germination, seeds from baccate fruits require less than do those from dry fruits. In fact, seeds of B. elegans germinated in 5 days when only 4 minutes of light was given once on each of the first three of these days. Although the sample was small in comparison to the total number of genera and species in the family, it nevertheless indicates the range of the light requirement and the range of days necessary for germination. From this sample of species one would predict that the majority of species of the Bromeliaceae produce seeds that require light for germination. There have been many articles dealing with the methods used by members for bromel seed sowing, but no one appears to have recorded in the Bulletins their observations on the early life of the plant after it has left its seed case behind and started to look around at its new surroundings. It is with this in mind that I pen these notes. In passing I would say that seed sowing with me has generally been successful so far, although I cannot remember preparing the seeds specially when my first sowing was made. On that occasion I had some orchid compost of osmunda fibre and Sphagnum in a 2" deep 5" diameter clay pan which was sunk in a tray of mixed vermiculite and sand, wet and heated below by means of soil heating cables. Don't think that this was a professional set-up; it was not, but it served its purpose well. Within three days those seeds were up and starting to grow with vigour. The seeds were of a tall growing tubular Billbergia very similar to Billbergia Rosea and were not cleaned. I remember that some of them were buried in the mixture for this was at a time when I did not have the Bulletins to guide me nor did I have any cultural experience of bromel seed sowing to go on. The pan was covered with the transparent cellophane lid from a chocolate box. Prickles were visible through a magnifying glass on the third or fourth leaf and were very fine and minute. At six months the plantlets were about three inches tall, with leaves disproportionately long and drooping. At this age they were individually potted into small 1½ inch peat cubes each with an individual hole for planting; the little plants were well firmed. They were replaced in the heated tray. Growth proceeded without interruption and at nine months they were moved into small 3" flower pots and potted in pure oak tan bark and sand, after having as much peat removed as possible, and again they were well firmed. The young plants' roots had in most cases penetrated right through the peat cubes into the vermiculite of the tray, and were very wiry and inclined to be brittle so that care had to be taken to confine the roots into their new homes. Some were replaced in the heated tray and others were strung up to the roof. Daily observation when watering does not allow one to note the growth, but visitors who saw the plants at intervals expressed surprise at the increase in size. After a further six months it was most noticeable that those hung up are sturdier and larger than those in the heated tray. This surely confirms the advice in the Bulletins that better bromels are obtained by raising them aloft. One curious thing however is that two or three of the hanging plants have sprung offshoots already — in one case a plant has three — which are as large, or nearly so, as the main youngster. The main plant is not injured in any way and I am wondering what is likely to happen next. At fifteen months the plants are in the region of nine inches tall and so far do not show any tendency for the leaves to take on the gray-green color of the old parent plants or even to show any of the bands or spots of scale markings; they are a rich bright apple green. Of course these small plants have another two years or so to go before reaching maturity. The leaves are tremendously long for the size of the plants, reaching two feet in length and one inch in width, firm in texture but not rigid. The diameter of the plants vary but the sturdiest is about ¾ inch. Slow growth has been made throughout the winter. Now that the main growing period is coming round again it will be very interesting to see the rate of growth in the plants' second year. It would appear that growth will have to be much more rapid to enable the plants to reach two-thirds maturity by the end of this year; it will be interesting to watch this, and also if and when the scale markings appear. FLORIDA WEST COAST BROMELIAD SOCIETY DISPLAYS BROMELIADS IN "LAVA"
Once again, by invitation of the Orchid Society of St. Petersburg, Florida, the Florida West Coast Bromeliad Society arranged a beautiful display of bromeliads at the Orchid Show held in the ballroom of the "Million Dollar" Pier at St. Petersburg, on January 25-26-27. The theme of the entire show, this year, was Hawaiian. So, with numerous orange crates and boxes cleverly covered with crumpled black (flame-proof) crepe paper and a back-drop, twenty feet long, of sheeting dyed sky-blue on which was a clever painting of Hawaiian coastline with mountains and fleeting, white clouds, the stage was set for the "planting" of bromeliads in this seeming lava. All bromeliads displayed in this "cascade of lava", ten feet from back drop to front, were supplied by members from their own homes and gardens. When completed it called forth many favorable comments from experts and public alike. One factor was particularly noticed this year. The public, today, seemed more understanding, more knowledgeable, may we say, in regard to bromeliads. There were fewer who referred to them as succulents or cacti although one, somewhat shortsighted lady loudly insisted that several fine Neoregelia spectabilis were Christmas Cactus (Zygocactus truncatus) as she "certainly could see those little red flowers at the ends of the branches." In general, the "lava" provided an excellent foundation color for bromeliads and all specimens showed to very good advantage. There were excellent Vriesia carinata and V. × "Marie" whose "painted feathers" caught all eyes; colorful Neoregelia farinosa with crimson cups; a tall, not definitely identified Billbergia with a huge pendant inflorescence; and a fine specimen of Aechmea miniata var. discolor × Ae. calyculata with its large, berry-like inflorescence of an orange color and the "berries" tipped with little flowers which turn white. At the left of the exhibit was an eight foot "driftwood" tree on which were growing many Vriesias and Tillandsias. At the foot was a large pineapple plant in fruit surrounded by many smaller Ananas. Picture, if you can, then, a twenty-foot wide display with the scenic background and this cascade of "lava" with the Bromelia-adorned driftwood tree and then, in the crevices and on the flat "rocks", the brilliant colored beauties of the Bromeliad kingdom—tall Aechmea Marmorata, and Fasciata, with colorful Schultesiana, × "Foster's Favorite", rich Miniata var. discolor and × "Royal Wine"; Billbergias meyerii, amoena viridis (a large, colorful specimen), Saundersii hybrids × "Muriel Waterman and others; Neoregelias and Nidulariums; interesting Guzmania, Orthophytum and Ochagavia specimens; delicate Cryptbergia Meadii and, scattered along the front at floor level, many colorful Cryptanthus hybrids. Judging was ably done by Mr. John Hall of Orlando and Dr. M. W. Dexter of Clearwater. Many ribbons are now the prized possession of members. The exhibit was readied on Friday, January 24th. The show opened on Saturday and, through that day, and through Sunday and Monday some 8,000 persons paid for admission. Much credit is due to all who aided in the work, but especially to Mrs. Harry F. Klein, chairman of the special show committee and to our president, Mr. John Beckner who painted the "mountains of Hawaii", Mr. Ray Martin and Mrs. Jos. Appleton, committee members, and to all other members who lent invaluable assistance both in erecting the exhibit, as hostesses, and in the final razing of this beautiful display. Early in February of this year we received a call from two ladies from the Clearwater Garden Club who asked that we put on an educational display of Bromeliads at their forthcoming Garden Show. Naturally, we were delighted to have an opportunity such as this and readily agreed. We live just half way between St. Petersburg and Clearwater, Florida and thus have interests in both cities. Later on a layout of the contemplated show in the Clearwater Auditorium was brought to us and we were amazed (and pleased!) to find we had been allotted a ten-foot square in the center of the hall at the end of an aisle and immediately in front of the stage. The entire show received almost 100% rating from the State judges and a very nice letter tells us that our exhibit had much to do with this judgment. To accomplish this we obtained two three-level display racks, 24 inches high by five feet long. These were placed back to back and covered with black flame-proof crepe paper. Pots were covered with foil and when all were placed Tillandsia usneoides (Spanish Moss) was interlaced between the plants. 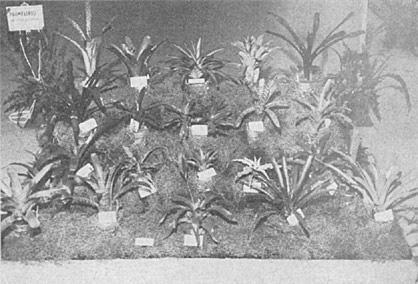 Some fifty or more plants were used in this four-sided display, on the shelves and on the floor around, with one large specimen plant at each corner of a roped-in enclosure. To further the educational idea each plant was ticketed with the botanical name in large, clearly-read letters. 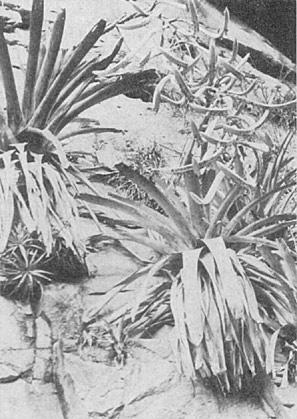 The accompanying photograph shows one side, towards the stage, and, as a matter of interest, the plants shown were, from left to right: Top row: Billbergia amoena var. viridis, Aechmea miniata var. discolor × Calyculata (bloom), Neoregelia Carolinae var. tricolor, Billbergia pyramidalis (Winter bloom — twin plants both in full bloom), Aechmea × "Foster's Favorite" with 7" inflorescence. Next row down: A. Foster's Favorite (bloom), A. Racinae (bloom), A. Orlandiana (three identical plants in single pot), A. × "Bert", A. calyculata. Second row down: A. miniata discolor, Cryptanthus bromelioides, A. Pineliana (dwarf variety), Cr. bromelioides tricolor, Neoregelia hybrid. On floor: B. Horrida var. Tigrina, V. × "Marie" (bloom), A. Schultesiana. The other side included such others as Till. Lindenii, A. × "Royal Wine", Quesnelia arvensis, Neoregelia spectabilis and N. marmorata, Cryptbergia Meadii and others. At the ends were plants mounted on hanging driftwood pieces and some tall plants such as A. Marmorata, B. Meyerii and B. Saundersi hybrids, while, prominently at corner positions stood a large A. Distichantha, A. Mexicana, Portea Petropolitana and a fine large specimen with two well-balanced, tall offshoots of Aechmea fasciata. Judging by the amount of interest exhibited and questions asked, we feel that many more people now have a knowledge of, and interest in, these fascinating Bromeliads. In Largo, Florida, situated half-way between St. Petersburg and Clearwater, the County Agent has his headquarters in the County Fair Grounds. In one of the halls, once a month, meet some 250-300 people from the area, interested in horticulture. This group is known as the Pinellas County Horticultural Society. On February 20th, by invitation, John Beckner, president of the Florida West Coast Bromeliad Society, gave a talk on bromeliads and answered many questions. A number of interesting plants were on display. Following this E. H Palmer showed a number of colored slides of bromeliads with a running, explanatory commentary. The amount of interest generated was evident in the fact that both were surrounded with questioners at the close of the meeting. It occurred to me to wonder if there might be present on stolons in addition to the actively growing tips, dormant lateral buds like those at the leaf bases of mature plants. Accordingly to find out, in removing an offshoot (Aechmea × "Foster's Favorite"), instead of making the cut close to the base of the parent plant I left a stub of the stolon and kept it under observation for some time; but no further growth occurred on this stolon. However, with another Aechmea (miniata discolor), after the short leaves on a developing offshoot had been accidentally broken off at the base, not one but three new shoots formed, so it is evident that the stolons do carry latent buds. It seems likely that the significant difference in the two cases is not the varieties of the plants, but the fact that in the first instance the stolon was dry and woody, and in the second plump and succulent. The observation suggests that more abundant propagation by offsets might be attained by amputating the growing tips of the basal growths that start; the method would be of particular importance with such of the rarer varieties as cannot be grown from seed, Aechmea chantinii for instance. A suggestion by Mr. R. G. Wilson of Miami has been found greatly to facilitate the removal of damaged or drying leaves from bromeliads: if a leaf is split or slit, it can be torn off at the base from the middle out much more readily than in the reverse fashion. If the halves are pulled simultaneously in opposite directions, almost no strain on the plant results. 3122 N. Calvert St., Baltimore 18, Md. As bromeliads are an American family bromeliad fans in the rest of the world must depend on the generosity of the members who live in brom-land for the introduction of new species. Nothing is more disheartening to a real plant lover than to know that he or she cannot enlarge their collections any further. If a few requests for seed were put in occasionally and a small paragraph was inserted each issue to remind people I am sure much more seed would become available. One of my hopes is that in the not too far distant future I can send some seed back to the Society for what has already been sent to me. Professor Werner Rauh of the University of Heidelberg has brought back to Germany a number of rare and new Bromeliads in his collections of living plants from the Andes of Peru and Ecuador. Of these, Puya argentea and Puya Rauhii have been described in "Phytologia" (vol. 5, pp. 397 and 398), and now material and photographs of a giant Tillandsia have been received. The plants grow on bare vertical cliffs and must have presented quite a problem in collection. In naming this new species in honor of Professor Rauh we hope that he will solve a second problem and establish it in cultivation. TILLANDSIA RAUHII L. B. Smith, sp. nov.
Planta spectabilis facie Tillandsiam Racinae L. B. Smith revocans sed laminis foliorum ligulatis, spicis latis complanatis, sepalis posterioribus carinatis differt. Flowering plant about 2 meters high when extended; leaves numerous, rosulate, 1-1.5 meters long, the blades ligulate, broadly rounded and apiculate with the apex sharply reflexed, 4-5 cm. wide, purple at apex, very obscurely punctulate-lepidote; scape stout, decurved; scape-bracts erect, densely imbricate, subfoliaceous; inflorescence pendent, laxly bipinnate, glabrous; primary bracts broadly ovate, mostly shorter than the sterile bases of the branches; spikes linear, acute, about 7 dm. long, 4 cm. wide, sigmoid-curved, strongly complanate, very many-flowered; floral bracts densely imbricate, elliptic, obtuse, 5 cm. long, ecarinate and broadly rounded on the back, coriaceous with a narrow thin margin, finely nerved when dry; sepals free, elliptic, obtuse, 30 mm. long, the posterior ones carinate; petals emerging between the bracts on the underside of the spike, soon flaccid and hanging straight down, 55 mm. long, the blade narrowly elliptic, dark violet; stamens exserted. Type in the U. S. National Herbarium, collected on vertical cliff walls below Florida in the valley of the Rio Sana, Department of Piura, Peru, alt. 700 meters, in 1956, by W. Rauh (P-379). Isotype in the Botanical Institute of the University, Heidelberg, Germany. Tillandsia Rauhii presents a very striking combination of colors with its green and purple leaves, white bracts, and dark violet corollas. It should prove most popular in cultivation. United States National Herbarium Smithsonian Institution, Washington, D. C.
After spending an evening answering numerous requests for cultural information, your secretary wonders whether some of you who grow your bromeliads under similar conditions would not like to form a Round Robin, thus exchanging ideas and perhaps plants. It is difficult for one who lives in "The Land of Eternal Summer" and who grows her bromeliads under entirely different conditions from those to be found in most parts of the country to understand completely the problems of others. 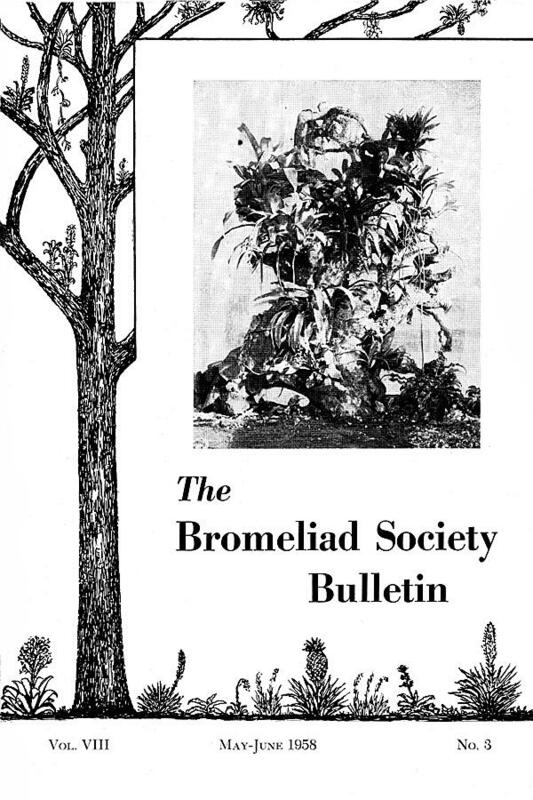 The Bromeliad Society started from a Round Robin — one that had been formed by THE FLOWER GROWER MAGAZINE to put people with kindred interests in touch with one another. A Bromeliad Round Robin for each section of the country might be of value and interest to many of you. If you are interested in getting in touch with those members who are confronted with the same growing problems as yours, write to your secretary and she will send you a list of names. Some notes by R. K. Taylor, "Speculation on Starting Side Shoots," in the July-August 1956 ( Vol. VI, No. 4) Bulletin, although very short, were quite interesting. We have found that the greater number of, at least the more commonly known bromeliads, form their side shoots at or near the base of the plant. And this rule seems to apply fairly well throughout the subfamily Bromelioideae. Such genera as Aechmea, Billbergia, Neoregelia, Nidularium, Canistrum and others of this subfamily — all produce their offshoots from or near the base. It is always interesting to make an observation of what appears to be a general rule and then, later, to discover the exceptions. I cannot recall any of the Bromelioideae, except Cryptanthus and some species of Orthophytum, and Ananas, that send offshoots from or near the axis. One exception being in Cryptanthus which are quite apt to produce side shoots from the base of even the topmost leaves directly under the axis cluster of male flowers. It is quite often that new offshoots may appear from the same axil from where the perfect flowers appear. Generally, the first offshoots appear in the upper part of the plant very soon after flowering. If these upper offshoots are removed or injured other off-shoots may continue to appear all the way down to the basal leaves. In fact, I have had a Cryptanthus plant produce as many as fifteen to twenty separate plants all fastened to one offshoot bud from the axil of a single basal leaf. Some of the pineapples (Ananas) will produce as many as ten to twenty offshoots at the top and or bottom of the mature fruit as well as below the leaves at base of plant. A similar condition has been found in Orthophytum Fosterianum where the new offshoots appear in the top of the inflorescences. It is not always necessary for growth to be stopped in the axis in order to produce offshoots from below. In fact, a number of Aechmea, Billbergia and other genera in the Subfamily Bromelioideae will produce offshoots at the base of the plant possibly one or two years before the plant has matured and its growth has stopped in the axis by producing the flowers and fruit. However, the general rule is that in most of the Bromelioideae the offshoots do not appear at least until the flowering period approaches. We find this rhythm which is so constant in Bromelioideae to have a number of other variations especially in Tillandsioideae. It is here that we find some of the most interesting exceptions in the family. The first time I was impressed with this exception was when I collected plants of Tillandsia grandis in Mexico, in 1937. I found many seedling plants of this species from three to eight inches high with as many as twenty little offshoots attached to their bases. They were not the usual offshoots closely united and emerging from the side near the base for they had the appearance of seedlings rather than offshoots; instead, they were tiny little plantlets attached with a thread-like stolon. Usually species with this habit do not send basal offshoots at maturity. A number of other species within this same subfamily have very similar habits, Vriesia funebris is an outstanding example. On the other hand, Tillandsia utriculata, rarely, if ever, sends out offshoots after maturity; it dies and depends upon its countless plumose seeds for its continued existence. Tillandsia karwinskyana sends off many typical stoloniferous shoots from one to two inches long covered with tiny leaf-like scales. These little stolons continue to appear from the basal leaves throughout the life of the plant. They develop into new plants and even though the mature plant, when it blooms, is but ten to twelve inches high, it rarely sends any of the usual offshoots after it matures, but there are many small plantlets continually developing to form a mass of plants. Tillandsia multicaulis also produces small seedling-like plantlets around the base of the plants. The inflorescences appear midway between the axis and the base of the many-leafed rosette. There may be from one to five of these lateral inflorescences and rarely is one seen appearing from the axis; there may be more but I have seen only one or two exceptions. In this species, however, we have still a different combination for there may appear the usual strong offshoots at the base after the main plant has died long after the miniature plantlets surrounding it had appeared. Either or both miniature plantlets and usual vigorous offshoots may reach maturity causing a large cluster of plants. This same system or variation also appears in other Tillandsias and Vriesias. We find yet another condition. In Guzmania sanguinea I have rarely ever seen an offshoot from the base of the plant of this species, but within a few days after the last flower has past, deep down in the axis, may be found one or more offshoots already appearing immediately next to the inflorescence. This inflorescence does not have a scape and is quite low in the rosette, appearing more like a small inflorescence of a Neoregelia. The new plant head appears up through the water-filled rosette, and the cluster of seed pods when mature appear to hang from the base of the new plant after the old leaves have disappeared. Although I have made many attempts to remove leaves so as to expose the light to the base of this species, in fact, to remove all the leaves excepting the new upper leaves, I have never been able to encourage any offshoots from below, and when all the leaves are removed it tends to slow down the whole works; the roots generally die at the base of the plant and later a new system of roots appear at the base of the new offshoot which has developed from around the axis of the plant. This habit causes a caulescent growth and it is not uncommon to find a plant of this species with its rosette of brilliant leaves at the axis of a long caulescent stem showing the scars along its sides where the plant has matured into fruiting heads in years past.